‘Good parking place at Schiphol P3. One I will remember.’ (a recent tweet by judoka Mark Huizinga about his parking place in Schiphol’s new P3 parking garage). Max Kisman (1953) is a graphic designer, illustrator, font designer and maker of animated films. He’s produced a large number of visuals for Dutch newspapers FD and de Volkskrant. 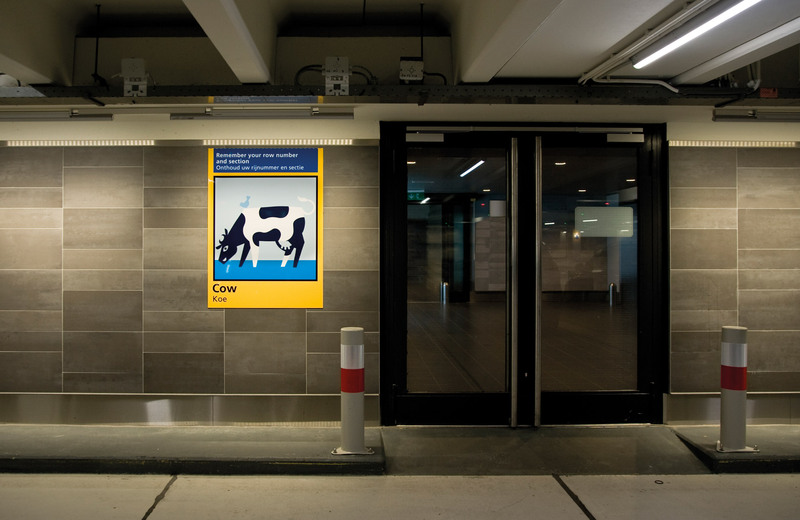 Last year, he assisted Schiphol and Mijksenaar in creating the new symbols in the P3 parking garage. Flows interviewed him about the subject. How do you find your way, and do you ever get lost? Using the sun to orientate yourself works very well, or using the direction of a stream. That’s mainly about points of reference in nature. Since the summer holiday, I’ve been using a TomTom with a pleasant Belgian voice. But you still need insights and references to familiarize yourself with what you’re doing. If you drive some place on autopilot and you’re redirected, you need a point of reference. Orientation and points of reference are very important to interpret and determine where you are (even who you are). What I like best, by the way, is to just drive around and see where I end up. 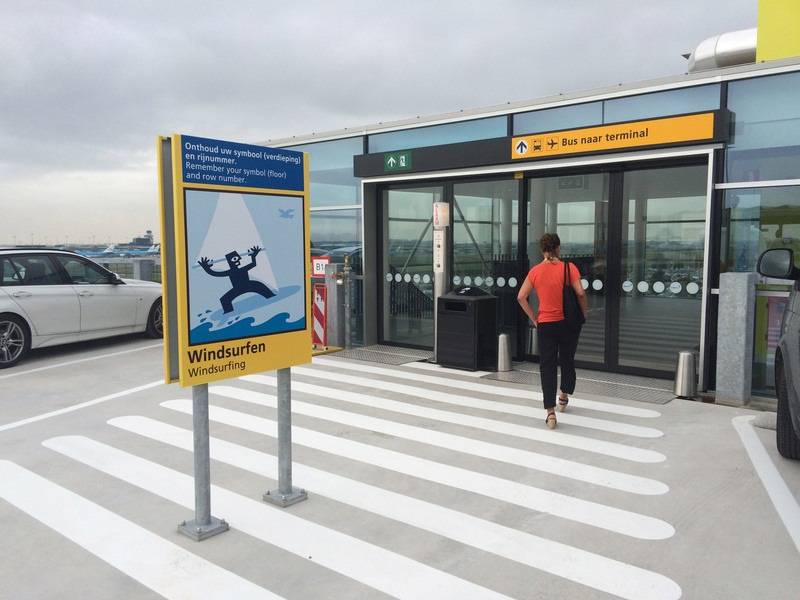 How do you see the collaboration with Mijksenaar on earlier projects, such as Schiphol’s P1? The Holland symbols for the P1 parking garage were given a new look and the symbols were also applied to the walls. ‘Graphic signs are my style, isolated visuals. First in P1 and now in P3, I created a story line with those visuals, which I found quite challenging. We’d done a lot of colour studies for the earlier P1 project. It soon turned out that as a key colour, blue fit best in the direct environment, the yellow sign. In reaching a decision about an approach, Mijksenaar is the spider in the web. If you compare us to a football team, they are the key player and I’m the forward player that has to flick the ball home. But Mijksenaar, with all of its knowledge, is the playmaker. If those joint efforts bear fruit, we all reap the rewards. The Schiphol team was a fun team to work with. And the fact that Mark Huizinga, who’s attention was entirely on other things at the time, noticed that, is great! Why did you use water sports visuals in P3? The decision to use water sports in P3 was ultimately made because of their link with travel. But I also made sketches of other themes, including one involving games such as billiards and chequers. What do you think about parking as an ‘experience’? Parking garages are usually very difficult to navigate. You decide to come by car, and so you also have to deal with the consequences of that decision. What I like are parking garages that indicate that they’re full. It’s a clear message, you know where you stand. So, clarity, but what about the experience? ‘The same thing happens when attention is focussed on a good wayfinding system: it will come across. Good and appropriate attention is an essential ingredient of the supplied product and an important part of the overall experience. What’s your favourite airport, and why? I first flew in the 1970s. At that time I liked Barcelona, because it was such a simple airfield. I also think it’s special to disembark down steps rather than via a jet bridge. I also especially like the smaller airports: London City, Jogjakarta, Dublin and a couple of southern European airports. When I fly, I like to get to the airport well on time. If I’m not, I start worrying whether everything’ll be all right. That’s my main objective. At the airport, all I care about is being able to find my way quickly and not being bothered by annoying music. When I first started flying, Europe still had borders. Crossing those borders was often intimidating. Travel is still something that isn’t really allowed, you’re always suspected of something. If only that could change … When I lived in the United States, returning by air, customs officers would often say: ‘Welcome home!’ After all of the stress of going through customs, that’s nice to hear and sounds sincere.